Eliminate bacteria, viruses, mold, mildew, and more with this simple homemade eco-friendly cleaner made with just three natural ingredients: cinnamon essential oil, vinegar, and distilled water. 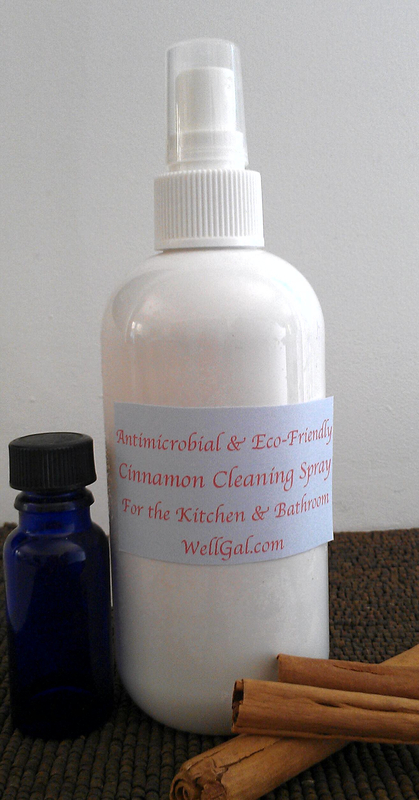 A recent scientific study published in the journal Food Control inspired me to come up with this earthy and all-natural antimicrobial cleaning spray made with Cinnamon cassia (C. cassia) essential oil, which gives it a warm, spicy scent. Kind of similar to a pack of cinnamon Trident gum I must admit! So, if you’re a cinnamon gum fan, you’ll love it. Guaranteed. Because the study showed C. cassia oil zapped Escherichia coli (E. coli) dead, I thought it would be great for green cleaning the kitchen and bathroom without having to resort to using toxic and harmful cleaners, such as bleach, to do the job. In addition to using C. cassia oil, though, I thought it would also be useful to add in vinegar, another powerful natural cleaning ingredient that’s been shown to kill viruses, eliminate mold and mildew, zap soap scum, and more. So why not give this zesty homemade cleaner a try for your tough kitchen and bathroom cleaning tasks? It’s effective, economical, environmentally friendly, and easy to make. Plus, you’ll get the added aromatherapy benefits from the C. cassia essential oil, which will make you feel energized — perfect when you need that little extra motivation to do some cleaning! Let me know how you like it. Note: A small bottle of C. cassia essential oil costs well under $10 and can easily be found in the personal care section of most natural grocery stores or on-line from sources such as Amazon. Because a little goes a long way and it won’t lose its potency when stored properly (i.e., out of direct heat and light), it should last you for months — or a few years — to come. Making this cleaner couldn’t be easier. First, add the water and vinegar to a spray bottle, then add in the essential oil. Put the sprayer cap on and shake well before each use. When using this cleaner, I’d let it sit for several minutes before rinsing with water or wiping it away. The Food Control study showed 15 minutes were necessary for the cinnamon oil to show bactericidal effects and other studies have shown that vinegar needs about 5 minutes to work. So, to be extra sure when cleaning something really icky, such as cutting boards contaminated with raw meat juices, I’d definitely wait at least 15 minutes. If you have other essential oils at home, such as orange, tangerine, grapefruit, bergamot, basil, rosemary, or lavender, they would complement the cinnamon nicely, not to mention add in other powerful cleaning benefits due to their antifungal, antibacterial, and antiviral benefits properties. The Food Control study showed that C. cassia oil, which is the essential oil derived from Cassia cinnamon, eliminated the six top strains of toxin-producing E. coli — the very ones that cause food poisoning. As little as a 0.1% concentration of C. cassia oil showed bactericidal effects on all tested strains of E. coli within 15 min. Whereas a 0.15% concentration actually killed three strains within 30 minutes, two in 60 minutes, and one in 120 minutes. Considering this, I decided that at least 15 drops, which is about a .15% concentration, would be the minimum amount that should be used in my 16 oz. cleaning solution recipe. But I didn’t want to use too much, because C. cassia essential oil can be very strong and irritating to mucous membranes. I often use 24 – 48 drops when adding in other essential oils to my vinegar-based cleaning sprays, so 24 drops seemed about right to me. Vinegar plays a key roll in amping up the cinnamon essential oil’s disinfectant powers and ensures a swift end to bacteria, viruses, fungus, and mold lurking on kitchen and bathroom surfaces. Studies have shown that vinegar is capable of killing bacteria and viruses, such as the human influenza A/H1N1 virus and Staphylococcus aureus (i.e., the bacteria that causes Staph infections). Plus, vinegar is great for so many other home cleaning chores, as I discuss in “Give Vinegar a Try! It’s Useful for Green Cleaning, Doing the Laundry, and More,” that is really worth getting acquainted with it. Finally, distilled water in and of itself also has the ability to reduce microbes as noted in this University of Maine article. So, buy a jug from the grocery store to keep on hand for when you do your cleaning. Of course, even if you’re vegan and never touch meat or other animal products, this cleaner is still useful to add to your eco-friendly cleaning regimen. It kills viruses, zaps other kinds of bacteria, eliminates mold and mildew, and even breaks down soap scum, so it’s great for cleaning sinks, toilets, showers, tubs, and tile in the bathroom. It’s also useful for other cleaning chores in the kitchen, such as breaking up grease splatters and cleaning stainless steel surfaces without leaving streaks behind. Because this cleaner contains vinegar, which is acidic, it’s not recommended for use on some stone surfaces, such as marble, or other surfaces like mother of pearl. When in doubt, test this cleaner on a small, inconspicuous area first. Essential oils are concentrated so they should be handled with care. Don’t let C. cassia oil come into direct contact with your skin or mucous membranes as it’s a dermal irritant and sensitizer. Also, in aromatherapy, C. cassia oil use is not recommended during pregnancy, so you may not want to use this cleaner while pregnant. If you get essential oil on your skin, wash with soapy water and rinse well. If it gets in your eyes, immediately flush your eyes with water for several minutes. If irritation persists, seek medical attention. Photos © Karen Peltier and Well Gal, 2014. Very very well recipe. Vinegar and lemon are very effective, specifically floor clean. This post are help many people to gain cleaning knowledge with experience. Thanks for this recipe. It works great. This also has done wonders got my sugar ant problem. I spray it around the baseboards near the sliding door where the ants like to come into the kitchen. It keeps them away for weeks and I feel safe using it around my pets. According to me one of the hardest things to do is pull out mold, mildew and gunk from in between the tiles in the bathroom. It is necessary to hire the services of professional mold removal companies as they know the best and easiest way to remove you mold permanently. Is it safe to use Cinnamon Cleaning Spray? Since there is an essential oil being used, is a glass spray bottle recommend? Great question. Essential oils can break down plastic over time, so using a good bottle is essential. When I mix up solutions with essential oils for personal care or simple aromatherapeutic uses, I often use an amber or cobalt blue glass bottle. However, when making green cleaning solutions, I find the glass bottles are too small as they’re often only available in smaller sizes (e.g., 1, 2, 4 ounces), so that’s when a plastic PET bottle comes in handy. PET won’t react with essential oils like a regular plastic would. You can find PET bottles online at Amazon here. Great post! I originally bought this oil just to put on the bottoms of my feet to soften them. But found many other awesome uses with great results. I love DIY and I will definitely try this out. Thanks for the tips and advance happy new year! While I’ll readily admit, I know very little about utilizing essential oils, I know even less about using them as cleaning agents! But the entire natural angle, definitely does appeal to me! Anything that prevents me from potentially be exposed to even more potentially harmful toxins! I’m all for that! Mark recently posted…Think Direct Marketing: If You’re Really Serious About Out Promoting Your Big Buck Competition! Hi Mark. Glad you got to find out about how essential oils can be used as antimicrobial cleaning agents. They really do work wonders at combating viruses, fungi, bacteria, and more. I hope you give the recipe a try! Really interesting and look simple to put together, where is the easiest place to get the Essential Oils? I may have to try this sometime when life is less hectic… lol. I get so busy with a lot of things and honestly, when it comes to cleaning, I rarely grab something more natural off the shelf. Most of the time it’s pretty harsh and suits me as when I smell bleach or something like fabuloso for my floor, then I’ve associated it with clean. Essential oils are so effective for so many things. I never thought of them as cleaning agents, but you showed me they really can be. Thanks for the cool recipe. Gottta give it a spin! David Merrill 101 recently posted…Do Shiny Objects Drive Online Entrepreneurs Crazy? Hi Sue. That’s one of the things I love most about making my own all-natural antibacterial cleaning products. I know what’s in them and I can modify them to suit my needs. They’re so quick and fun to make, too! I love these natural ways to keep the house clean. Essential oils are marvellous for so many things. Hello Yorinda. Thanks for your positive comment! I’m glad you love using essential oils and natural ingredients for cleaning as much as I do! Let me know if you get a chance to try cinnamon oil in your cleaning routine and how you like it. This definitely sounds worth a try but the downside of living on an Island is that so many things aren’t available and the cost of shipping is stupid. Still, you’ve definitely inspired me to at least take a look at our local health food stores and see what I can find. Thanks! Hi Marquita. If you have a Whole Foods Market nearby where you live, they should carry a variety of essential oils, including C. cassia (cinnamon). Hopefully you can find it! It’s also fun to mix it with some orange essential oil for when the holidays roll around. It’s a festive scent that can permeate a whole room easily when put in an aromatherapy diffuser. I have used vinegar and bleach and water to clean the floors and the bathroom, but this cassia essential oil plus vinegar and distilled water sounds like a wonderful way to clean without adding toxins to my home environment. Can’t wait to start using that. Thank you. Hello Dr. Goodstone. Glad to hear you’re excited about giving the cinnamon cleaning spray a go! It really is a great toxin-free way to clean and combat pesky bacteria. Also, I just wanted to make sure you’re not mixing bleach and vinegar while cleaning, right? Otherwise, dangerous fumes can result. Hey Karen, What a great suggestion, cleaning products have such strong smells and I imagine can not be good for you HUH? Hi Chery. Thanks for your comment. Yes, I agree that some store-bought, conventional cleaning products can practically knock you out with the smell from their strong toxic ingredients! So, it’s always nice to mix up your own cleaning products, so you can control how strong the scent is. Feel free to modify the cinnamon cleaning spray recipe as necessary to adjust the smell to suit your needs. This is GREAT. I had a person just asking about this a little while ago. I am going to share this with her. Hi Heather. Thanks for the positive comment! And thanks for sharing the recipe! I appreciate it.